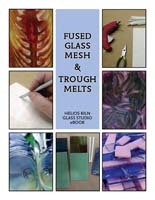 I just received a copy of the new Ebook Fused Glass Trough and Mesh Melt from over fusedglass.org. I feel like a very lucky girl and can’t wait to get these things made so I can expand my glass palette. The possibilities are endless. And once you go through the book you’ll see that this is just the beginning of what you can do with these techniques. Paul Tarlow has written this book and like his other books, he provides concise direction that anyone, beginners included, can do. fusedglass.org has always provided more information than you thought you needed and these books are an added bonus. So if you want to add some very interesting elements to your glass work you must order this book and with supplies that you probably already have in your studio you can be making some impressive melts right away.